Bear Bottoms will come right to your door each week with unlimited diapers, for only $19.95 + a small fuel charge based on your location. That’s cheaper than a bag of disposables! Please note that delivery to Toronto addresses is $21.95 + a small fuel charge per week. This Toronto pricing is due to the distance to deliver from our laundry facility in Kitchener. Unlimited diapers delivered once per week for a 26 week term. This is a non-refundable upfront payment that you can take advantage of at any time. This represents a 10% discount on the weekly service. Delivery to Toronto addresses with 26 week prepay discount is $19.75 per week. Bear Bottoms offers a 50% discount on your second baby as long as two babies are using our service and are living at the same address. 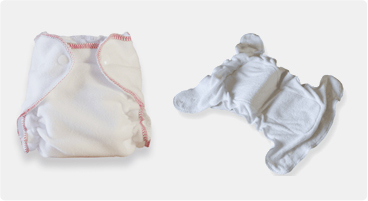 Bear Bottoms offers cloth wipes as an additional service. Super easy to use, just wet with warm water, clean your baby and throw in the diaper wet bag we provide along with the cloth diapers. Please note that there is no long term commitment with Bear Bottoms Diaper Service! We only require two weeks notice of cancellation should you wish to leave the service. SERVICE TO TORONTO ADDRESSES IS $21.95 + SMALL FUEL CHARGE PER WEEK (all other areas of service are $19.95 + small fuel charge weekly). The higher pricing for Toronto is due to the distance to provide service from our Kitchener laundry facility. REFERRAL PROGRAM: We are pleased to offer one week FREE service to any customer who refers a new client. Service is billed on the 1st and 15th of each month. Please see our policies and procedures for terms of service. There will be a small fuel charge applied to all clients’ weekly service fee (based on location).